Welcome to the top spot, Samsung. The outstanding Samsung Galaxy Tab 10.1 Honeycomb tablet is lighter and a hair thinner than the Apple iPad 2, and has a smaller footprint than either the Motorola Xoom or the Acer Iconia Tab A500, which are heavier and bulkier than most tablets. The Samsung Galaxy Tab 10.1 is a major contender. We reviewed the short-lived Samsung Galaxy Tab 10.1V already, but that thicker and heavier device has since been discontinued (It looked as if Vodafone might pick up the 10.1V tab but it is now waiting to release the newer 10.1 model).The only other important players in the tablet market, are the brilliant 10.1-inch Asus Eee Pad Transformer as well as the BlackBerry PlayBook and the HTC Flyer, which are both so-so 7-inch models. Oh, and keep your eye on the HP TouchPad which goes on sale in the UK next month. The Galaxy Tab 10.1 is currently slated to go on sale in the UK at the end of July/beginning of August. So what sets the Samsung Galaxy Tab 10.1 apart? For starters, this is one light and thin tablet. At just 8.6mm, it is 0.2mm thinner than the iPad 2. And you know what? At 565g it's also 36g lighter. It's as though someone at Samsung sat down and demanded that the 10.1 have world-beating raw system specs. The Samsung Galaxy Tab 10.1 is a marvel of engineering, given its size. Holding one in your hand, you might mistake it for a truncated version of a Samsung LED HDTV, which are also market leaders. There's a slight edge around the screen that is not touch enabled, a silver edge, and an all-white back. The device just feels right. Unlike the Acer Iconia A500 and the Motorola Xoom, the Samsung Galaxy Tab 10.1 finds that ideal balance between a pick-up-and go e-book reader such as the Amazon Kindle 3 and a 10-inch tablet that's perfect for watching movies on a long car trip. By including Android Honeycomb (version 3.1 to be exact) Samsung has also one-upped the competition (though 3.1 has also already landed on the Transformer). The point release includes a few new additions. You can resize widgets and scroll through open apps in the pop-up thumbnails for the "recent apps" list. The Samsung Galaxy Tab 10.1 doesn't have a USB port, so it doesn't take advantage of the new Android 3.1 feature to support USB-connected peripherals which is a shame, but that's not the direction Samsung is going with this tablet. This is all about pick-up-and-go functionality and portability. Samsung actually downgraded the built-in camera on the Galaxy Tab 10.1 compared to the Galaxy Tab 10.1V, which had an 8MP rear camera. Still, the new model has a 3MP rear camera, which is three times higher than the Apple iPad 2's camera. There's also a front-facing 2MP camera. There are quite a few interesting perks and additions on this tablet. Some may seem underwhelming at first, but as a whole they give Apple a good run for the prize. One subtle change is that the Samsung Galaxy Tab 10.1 has a 7000mAh battery for all-day tablet use. In our tests, it lasted about nine hours for everyday tasks. The Apple iPad 2 battery is 6600mAh. The 10.1 also has a four-way accelerometer and gyro (the Apple iPad 2 uses a three-way accelerometer and gyro - starting to see a pattern here?). That may seem like a minor upgrade, but most of the games we tested on the Galaxy Tab 10.1 responded faster to quick turns and screen rotations, and generally worked better for controlling games. It also has great side speakers for playing music and movie audio, and plays smooth 1080p video. And of course, the Samsung Galaxy Tab 10.1 matches the features of other Android tabs: built-in GPS, support for Adobe Flash in the browser (you still have to download it on your own), 1290 x 800 screen resolution, Bluetooth and Wi-Fi, the Nvidia Tegra 2 dual-core processor and Android tablet app. 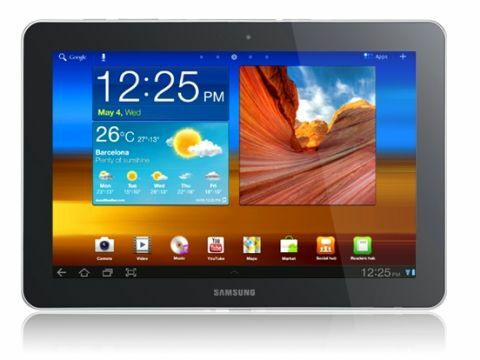 The Samsung Galaxy Tab 10.1 is a smart buy for anyone who wants a light and portable Android tablet. Google still has a ways to go on apps for Android – there are only a few dozen that are seriously worth downloading, compared to thousands of worthy iOS apps. The ecosystem for media is a bit underdeveloped on the Samsung Galaxy Tab 10.1 as well. Sure, you can watch movies stream on the web, but for downloads you're mostly on your own. August 5 2011: Samsung has now released a software update for the Samsung Galaxy Tab 10.1 (the kernel says 2.6.36.3 but the Android OS version is still 3.1). The 10.1 now comes with Samsung's TouchWiz software overlay which is designed to add some more features to Android by building on the foundations that Google laid down. There is now a small arrow in the middle of the taskbar at the bottom of the screen. You press that, and can open the new Task Manager (to close and open apps), a Calendar (which uses Google Cal), a World Clock, a Pen Memo widget (for adding notes and drawing), a Calculator, and a Music Player. Each of these works reliably and adds to the value of the Galaxy Tab 10.1 beyond the usual Android 3.1 release on other tabs. Widgets stay up on the screen at all times, even when you open other apps. Samsung also (finally) released the Music Hub, Media Hub, and Social Hub apps. There is also a new app called eBook which lets you read books you have downloaded from other book stores like Kobo, or that you have obtained by other means – such as download a free ePub file. As you might guess, the eBook app is not tied into the Kindle store, and so that means a separate app. You can add stores which are just links that take you to those Web sites to buy more books. In the box Samsung includes a charger, USB cable and earbuds, but no case or docking stand. The Galaxy Tab 10.1 has been price-matched with the Apple iPad 2, which means that devices with the same amount of memory costs the same. So the starting price will be about £399.